In the months since Donald Trump's shocking presidential upset, a movement has been coalescing in America-and when millions of women descended upon Washington, DC in January 2017 (and six hundred sister marches all across the country and the world), it was a wake-up call and the largest single-day demonstration in the history of the United States. But the truth is, women's rights didn't start or end there. There's a lot more to do. 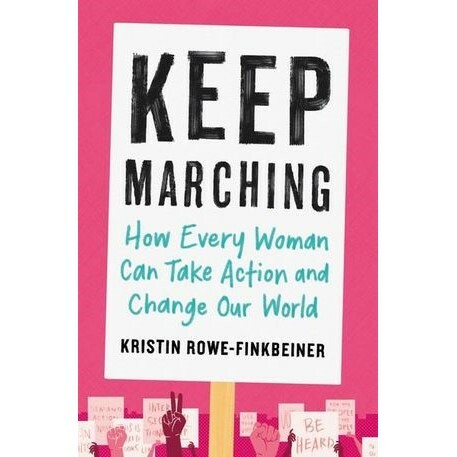 In Keep Marching, CEO of MomsRising.org and one of the contributing authors of the Unity Principles Kristin Rowe-Finkbeiner examines societal, institutional, and political barriers that women historically and currently face and what you can do to dismantle them. Filled with inspiring stories from women on the front lines, along with revealing facts and insights on key issues to arm you with the intel you need to debate anyone from a male chauvinist boss to a policymaker, Keep Marching is a groundbreaking, definitive work that will help move our country forward. With each chapter focusing on different issues, from gender and racial discriminating laws, mass incarceration, family economic security, glass ceilings, violence against women, reproductive rights and more; Rowe-Finkbeiner offers practical tips and to-do lists on organizing and effecting change in our own communities, advances policy solutions that will lift everyone, and shares high impact strategies that anyone can use to keep marching online and on the ground (and why it matters so much). This book is a roadmap for a continued movement toward equality. More and more people realize that democracy isn't about one election, one Oval Office, one march, or one day-but it is instead about making democracy a regular practice in our everyday lives. Keep Marching calls for a continued path to change-and it will be lifted by the platform of action and engagement of MomsRising.org, which has an audience of over a million women. 100% of the proceeds of the book will be donated to MomsRising. Kristin Rowe-Finkbeiner has over two decades of experience as an organizer and advocate. She is a frequent public speaker, radio host, and an award-winning author of books, including The F-Wordand The Motherhood Manifesto, which she co-authored with Joan Blades and which helped to launch MomsRising in 2006. She has also been published and featured in numerous outlets, including: Politico, USA Today, CNN, MSNBC, Washington Post, and Huffington Post.